I just returned from Abu Dhabi last week. One of my screenplays was selected as a finalist for the Shasha Grant Screenplay competition and was flown to Abu Dhabi for the Circle Conference. For two days we traveled throughout the country on a retreat to learn about Bedouin Culture while getting to know the panelists attending the conference. The Conference had panels everyday with a key note speaker everynight including: the directors Spike Lee, McG and actor Antonio Banderas. For the competition, we were matched with mentors to hone our pitch, then we pitched some Hollywood heavyweights. Then we attended the opening night of the Middle East Film Festival before returning home. I loved the experience of the retreat. It was so relaxing to be out in the desert under the stars. The whole trip was the opportunity of a life time. I loved getting to know His Excellency Salem Ebrahim Al Mazrouei and hear about his culture and stories of living in Los Angeles. He was the perfect guide for the retreat and showing us the best of the Bedouin culture. The mentor session gave me the opportunity to hone my pitch and feedback that my mentors Bob Yari and Hal Sadoff, Head of Film at ICM offered was great. 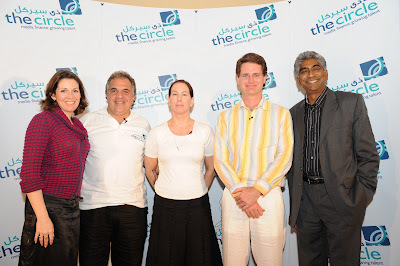 It was a challenge to pitch Kathleen Kennedy, Ashok Amritraj and Jim Gianopulos and I did not win the competition. However, the trip was fantastic and for the experience and the contacts, we are all winners. See attached two pictures taken after my pitch in Abu Dhabi. Adrienne Briggs, Directo of The Circle Conference.